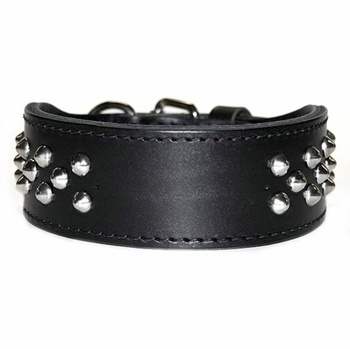 Your dog will look great in our big 2 inch wide heavy duty 2-ply leather collar with studs. Our leather dog collar has nickel plated studs and tapers to 1 inch wide at the buckle for easy buckling. This is a dee in front style dog collar. This collar with studs is available in black or brown oiled leather. This collar has a space for a name plate which we will attach for FREE!. Collars with name plates attached can not be returned for refund or exchanged. For correct collar size, measure your dogs neck. Size 19 will fit a dog with a 14 inch to 16-1/2 inch neck. Size 21 will fit a dog with a 16 inch to 18-1/2 inch neck. Size 23 will fit a dog with a 18 inch to 20-1/2 inch neck. Size 25 will fit a dog with a 19-1/2 inch to 22 inch neck. Size 27 will fit a dog with a 21-1/2 inch to 23-1/2 inch neck. Size 30 will fit a dog with a 24 inch to 26-1/2 inch neck. Brown collars size 19 21, 23 and 25 are $19.99. Brown collars size 27 and 30 are $29.99. Black collars size 19, 21, 23 and 25 are $29.99.